Injured and aging pets can find even shallow climbs or descents prohibitive. This HalfSTEP Pet Ramp, with its portable design and helpful texture, reduces struggle for dogs, cats, and the owners who otherwise have to lift them. The HalfStep is a scaled-down version of the PetStep II Folding Dog Ramp. Constructed from polypropylene and glass fiber capable of holding up to 500 pounds at a time, the ramp stays put with a rubberized grip. A ribbed, non-slip surface helps pets feel secure and keep their footing. It also reduces arthritis and dysplasia pain, pet ramps lower the chances of injury, and cuts down on back strain. The ramp is weather-resistant, easy to clean with soap and water, will not rust or corrode and designed not to trap odors. Measuring 39 by 17 by 3.5 inches, it weighs 11 pounds and holds up to 500 pounds at a time. Note: This item ships directly from the manufacturer. Delivery 10-15 business days. 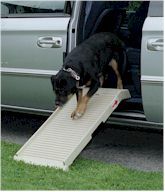 The PetStep HalfStep Dog Ramp gives your dog a hand in getting in and out of vans, cars and RV's. Also great for letting your dog up and down from your bed, sofa or chairs.